The chairman of the public inquiry into the death of Victoria Climbie said he had "absolutely no confidence" that a tragedy of that sort would not happen again. Lord Laming, who oversaw the 15-month long inquiry into the death of eight-year-old, said that child protection laws need to be properly implemented if the government wanted to prevent another inquiry into a child abuse death. "What happened to this little girl was shocking in the extreme," he told the Commons Health Select Committee. "I find it still personally distressing. It is for that reason that this is an opportunity to make sure that what happened at the front door of local services are up to standard." Lord Laming restated his report recommendation for the appointment of a Children's Commissioner for England, reporting to a board to be chaired by a Cabinet minister. He also wants the establishment of a national database to track every child's health, welfare and educational progress. 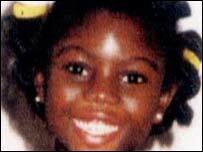 Victoria, of Tottenham, north London, died in February 2000 after suffering months of torture and abuse from her carers. She was beaten, starved and trussed in a bin bag by her great aunt Marie Therese Kouao and Kouao's boyfriend Carl Manning. 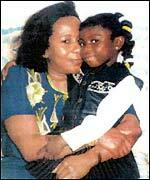 Both were jailed for life for her murder. Lord Laming said different agencies in the Victoria's case were battling against a "bureaucratic nightmare" in which they thought others were taking the lead but no-one was making vital decisions. Senior managers were promoted while their services were "going down the pan" and they distanced themselves from any responsibility for it by claiming their involvement was only strategic, he added. At least 89 of the 108 recommendations Lord Laming made in his damning report in January to shake up standards in Britain's child protection services should be implemented by July, he stressed. Fatal flaws within the system, which meant police, social workers and medics missed at least 12 chances to save eight-year-old Victoria's life, had to be addressed so that children were at the heart of the decision-making process. Victoria was known to no less than four social services departments, two housing authorities, two police child protection teams, a specialist centre of the NSPCC and had been admitted to two different hospitals. Lack of accountability and transparency, poor communication and co-ordination between services, low morale and limited staff training and resources blight the system nationally, and not just in the inner city where Victoria died, Lord Laming added.